Harrogate is a refined, comfortable pullover, shown in both a smooth superwash and in a true wool-lover’s wool. The classic cabled pullover is flexible in terms of silhouette and styling; the Customfit version of Harrogate updates the original with vertical waist shaping darts on the back of the sweater only for hourglass patterns (so the shaping doesn't interrupt the cables), more silhouette options, and a slightly deeper neckline. 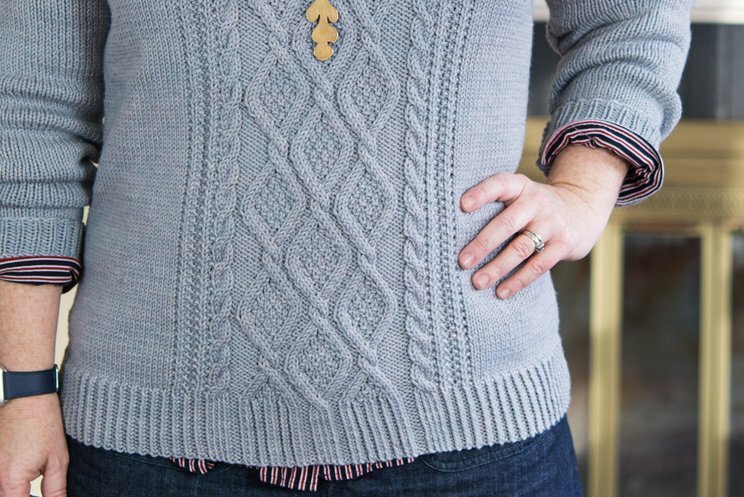 It retains intricate-looking stitch patterns, strong vertical elements, and luscious yarn. 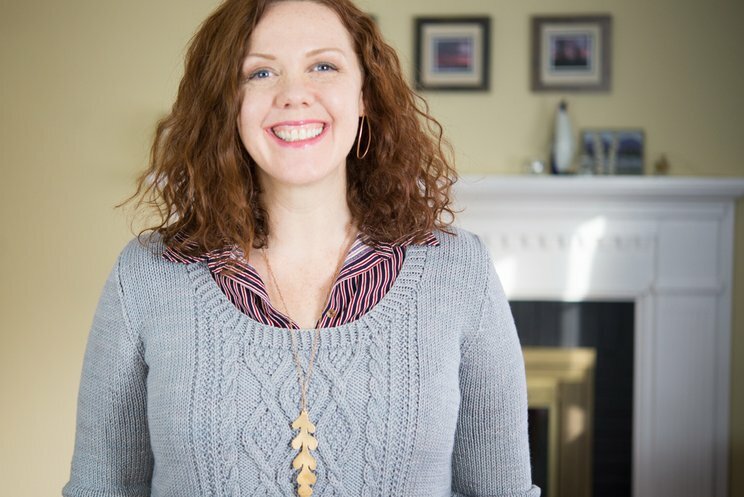 If you'd like to make the mock turtleneck version shown here in yellow, please use the "customize fit specifics" button on this page and raise the neckline depth until it's 3'' (7.5 cm) below the shoulders. 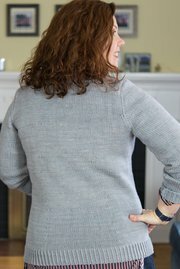 When trimming the neckline, work in twisted 1x1 ribbing for 2'' (5 cm) rather than the 1'' (2.5 cm) shown in Amy's gray sweater. Amy is shown wearing Harrogate in an hourglass average fit. Jackie is shown wearing Harrogate in an hourglass close fit. The samples are made from Mrs Crosby Loves to Play Steamer Trunk in "Greystone" and Lorna's Laces Masham in 'Buffalo Grove'. 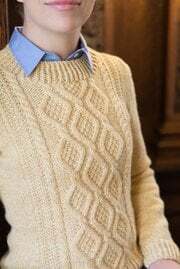 Please use a worsted weight (ish) yarn, and swatch in Stockinette, for this design. 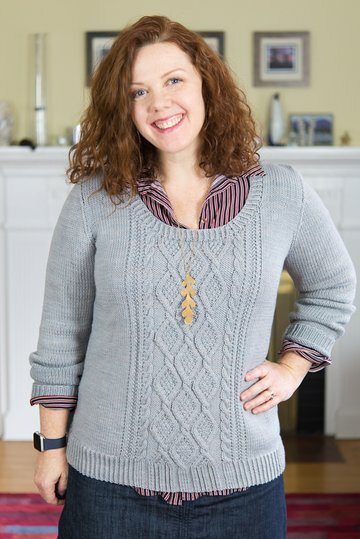 Amy's (gray) sample is shown in Mrs Crosby Loves to Play Steamer Trunk in the color "Greystone". Amy liked this yarn at a Stockinette gauge of 20 stitches and 28 rows to 4'' (10 cm); at that gauge, you'll need approximately 6 (6, 7, 7, 8, 8, 8, 9, 10, 10, 11, 12) hanks for a standard size 30 (32, 34, 36, 38, 40, 42, 44, 46, 48, 50, 54)” garment. Jackie's (yellow) sample is shown in Lorna's Laces Masham in the color 'Buffalo Grove'. Amy liked this yarn at a Stockinette gauge of 18 stitches and 26 rows to 4'' (10 cm); at that gauge, you'll need approximately 5 (5, 5, 6, 6, 6, 7, 7, 8, 8, 8, 9) hanks of Masham for a standard size 30 (32, 34, 36, 38, 40, 42, 44, 46, 48, 50, 54)” garment. If you're not using Masham, or you're getting a different gauge, I strongly recommend the app Stashbot by Hannah Fettig for yardage estimations.